Organizations and institutions need to start capturing all their data today or risk losing out on future predictive intelligence opportunities. Built on Apache Spark, Lingk SQL recipes provide a uniform interface for Spark batch and stream data processing. Data from on-prem, cloud systems (Salesforce, Workday, Canvas, Oracle PeopleSoft, Ellucian, etc.) and data standards (Caliper, xAPI, OneRoster, etc.) can be aggregated, cleansed and migrated to popular lakes and warehouses. An iPaaS is supposed to remove the need for building integration with custom code. Industry-domain connectors, big data processing, and streaming data are three areas that your team may resort to custom coding. Extending your iPaaS with Lingk via iPaaS provided micro-services provides an easy, scalable solution to remove spaghetti code. Remember spaghetti code in your iPaaS is the same as spaghetti code outside your iPaaS! Do you know how many integrations you have? Have you experienced the pain of key resources leaving without sharing their knowledge? For this reason, Lingk built a workspace model that enables projects to be more easily organized, documented, and managed for operational efficiency and business continuity. If your organization uses Apache Spark, Lingk can supercharge your implementation and increase value with expanded use cases. Lingk recipes create Apache Spark jobs and leverage Spark SQL for powerful in-memory data processing across ETL and ELT integration scenarios. With Lingk Speed Wizards it's easier than ever to quickly build 360-degree views, load data into Salesforce, use SF HEDA for SAL, and drive on-demand reporting. Speed Wizards provide citizen integrators and system administrators strong guidance for auto loading data from flat files, SFTP, LMS, ERP and SIS to Salesforce and other systems. Combined with a wide range of enterprise and industry connectors, reusable SQL recipes and Speed Wizards, Lingk provides a powerful new approach for sales and customer operation teams managing data automation and connected analytics. No longer be confused looking at a blank canvas to get started or a myriad of boxes and lines to understand what's happening with your data. Cloud integration and APIs can be difficult for existing team members who have spent a lifetime managing data in databases. With Lingk, those skill sets can immediately be leveraged for cloud integration using reusable SQL statements connecting disparate systems in agile recipes. Managing integration projects sometimes requires cross-functional communication between business analysts, IT, DBAs, ISV vendors, SIs and more. Lingk workspaces enable project teams to gain access to the same resources, bringing collaboration and execution together in a single platform. Where data persists and processing occurs is a big deal. Your data architecture needs to comply with an increasing number international laws, vendor agreements and local mandates. The Lingk Transformer Engine, running on top of Apache Spark, is stateless and can be deployed where you need it to be. Building integration experiences into your application is a heavy lift and can take away from more important roadmap items. For the full Lingk experience, Lingk provides whitelabel workspaces, customized recommended actions, and in-app documentation. Lingk Speed Wizards can be embedded into your app and have custom skins. 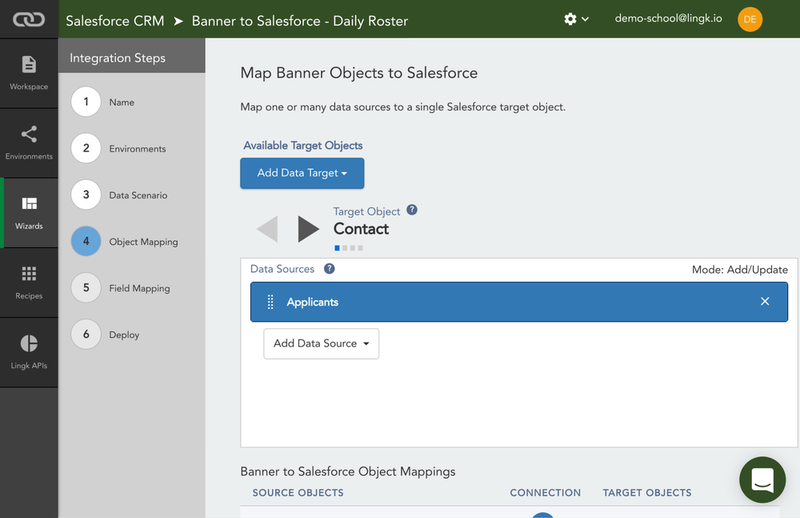 Data scenarios providing auto-mapping in wizards can be customized for your customer's commonly used data sources and targets. Apache Spark powers the data architecture of 1000s of enterprises. With Lingk, you give your business a competitive advantage in modern data integration, processing, and machine learning. Learn more about Lingk's consulting services. Lingk provides customers a new and exciting way to support learners and to meet their institution’s objectives by synchronizing Canvas LMS and Salesforce CRM data.